Let our nail technicians pamper you with a relaxing massage and the very latest in manicure and pedicure techniques and products. 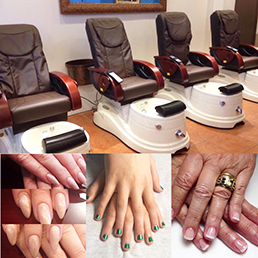 Some of our latest menu additions include manicures and pedicures with gel or Shellac. Pedicure chairs include a jet-massage foot bath and adjustable massage chair with optional seat heating.